This is a recipe for all the chocolate lovers out there! 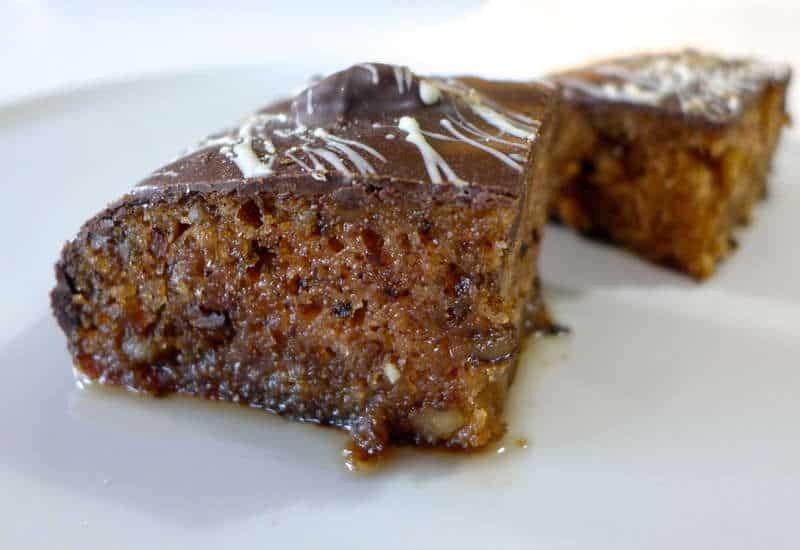 Think of the signature fluffy and moist Greek walnut cake (karidopita) infused with a cinnamon and clove syrup only this time covered with a crispy, thick chocolate glaze. Simply mouthwatering! This walnut cake recipe uses the traditional Greek recipe which calls for breadcrumbs as the key cake ingredient instead of flour (read more here). Breadcrumbs are much better in absorbing the syrup resulting in an extra moist cake without getting soggy or heavy. So if you have any other recipes for this Greek walnut cake that use flour, just throw them away! In this walnut cake recipe, we present two different kinds of glazing. A classic chocolate ganache and a delicious cocoa-based chocolate glaze for you to choose. The chocolate glaze is cheaper and simpler to prepare but the chocolate ganache is pure chocolate and will result in an extra crispy crust that crackles beautifully when dug into with a spoon. As always, feel free to comment in the section below with any recommendations, ideas, comments or just to say hi! And don’t forget to share with your friends on your favourite social network using the links above. To prepare this delicious walnut chocolate cake, add in a mixers bowl the sugar and butter. Mix for at least 5 minutes, until smooth and creamy. Add the egg yolks, one at a time, whilst continue mixing. Be careful to wait each time for each egg to be absorbed, before adding the next. Pour in the cognac and the orange zest, mix for 10 more seconds and set the mixture aside. In a large bowl add the breadcrumbs or powdered Melba toast, the chopped walnuts, cinnamon, clove, nutmeg, baking powder and blend with a spoon. Use a blender or food processor to chop the walnuts, being careful not to powder. For a more authentic texture of your cake use roughly chopped walnuts. Combine the mixtures from step 1 and 2 and blend, until smooth. Add the egg whites and a pinch of salt in a mixers bowl, but be careful that your egg whites, bowl and whisk attachments are clean and free of any water. Whisk the egg whites until the mixture is very thick and glossy and a long trailing peak forms when the whisk is lifted (meringues). Using a spatula, add gradually the meringues into the mixture (from step 3) and blend with light circular movements from the bottom up, until the ingredients combine. Butter the bottom and sides of a round baking tray (approx. 30cm diameter) and bake in a preheated oven at 170C, for about 35 minutes, until nicely colored on the outside and baked through. Check if it is ready, by sticking in the middle of the walnut cake a wooden skewer or toothpick. If it comes out clean, then the cake is ready. Let the cake cool down for a while and then prepare the syrup. Add all the ingredients for the syrup into a pot and bring to the boil. As soon as the sugar has dissolved, the syrup is ready. Ladle slowly the hot syrup over the cold cake, allowing time for each ladle of syrup to be absorbed. Let it cool down for a while and start preparing the chocolate glaze! You can either prepare a cocoa based chocolate glaze or an chocolate ganache for the coating. The chocolate glaze is always cheaper, but the chocolate ganache is pure chocolate! So it’s up to you. If you choose to coat the walnut cake with chocolate glaze, then melt the butter in a saucepan and sift in the icing sugar and the cocoa powder. Remove the pan from the stove and whisk to combine the ingredients. Whisk, until all of the butter is absorbed and the glaze is smooth. Allow to cool for 5-10 minutes and pour over the cake. If you choose to coat the walnut cake with chocolate ganache, then place the cream in a small saucepan over medium heat and bring to just below boiling point. Place the chopped chocolate in a heatproof bowl and pour over the hot cream. Stir together until melted and smooth. Allow to cool down for 10-15 minutes before icing the cake. This Greek walnut cake is ideally served cold with some vanilla ice-cream aside. Enjoy!! When do you take the cake out of the pan — before or after pouring on the syrup? can this be eaten the next day or will it be too soggy?